"The weather is bad, you're feeling bored and you would love to go fishing...then Top Angler is here to help!" 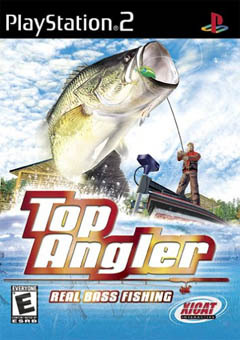 Top Angler is a fishing simulation game for the PS2 and is aimed at gamers or their dads who love fishing. The premise of Top Angler is simple, you must select your bait, tackle and rods and go fishing through various locations. 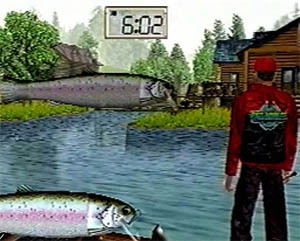 The strong point of Top Angler: Bass Fishing are the graphics which offer a unique type of realism. There are a wide variety of water effects that make this game shine above other fishing games. Apart from the impressively looking water effects, the underwater environments are filled with a plethora of objects such as old trees, wheels and various other oddities that people throw into lakes. No Johnny Hoffer unfortunately. Each of these items contains just the right amount of detail to think that they have been lying on the bottom of the river or lake for some time. Apart from these unique objects that now lie dormant under the water is a wide variety of different types of plant life and fish. 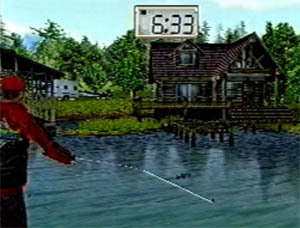 The fish of Top Angler boasts some of the realistic computer animated fish that I have ever seen. They move like real fish, look like real fish and act like real fish. The above water environments are quite simplistic but do offer a relaxing type of solitude from it's peaceful looking environments. You see trees, peaceful lakes and a wide variety of buildings that will hopefully make you think that you are fishing. The music of Top Angler is unfortunately one of the most annoying musical scores I've heard for a game. The reason being is that the music does not suit the game at all and unfortunately you cannot turn the music off. Apart from the music, the sound effects are limited because as you all know, only so much sound can be heard underwater. Fortunately, there is enough sound effects such as underwater distortions, water noises, splashing and rod effects to make up for the music. The gameplay of Top Anger is quite easy to get the hang of, depending on what type of fish you are trying to lure. You use the X button to throw the line into the water and then press the X again to use it as a power meter. Hopefully, if you've thrown the line into the right place and fish are hungry enough, you will soon get a bite. Once you've caught a fish, you must carefully wind them in. This game may not appeal to many gamers but if you are interested in fishing or know someone who is, than this game is for them. Unless you're one of those cooky people who love those strange weird games. If you like fishing, check it out!